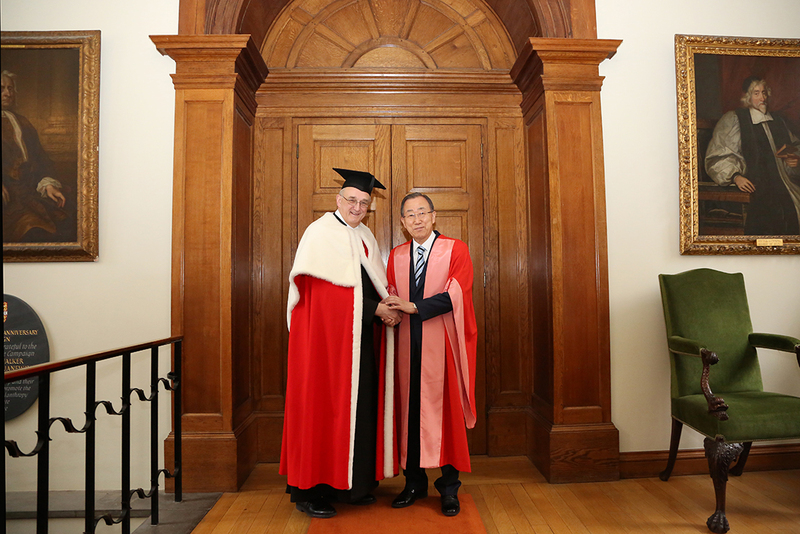 The Vice-Chancellor, Professor Sir Leszek Borysiewicz conferred an honorary degree on His Excellency Ban Ki-moon, Secretary-General of The United Nations, in the Senate House earlier today. 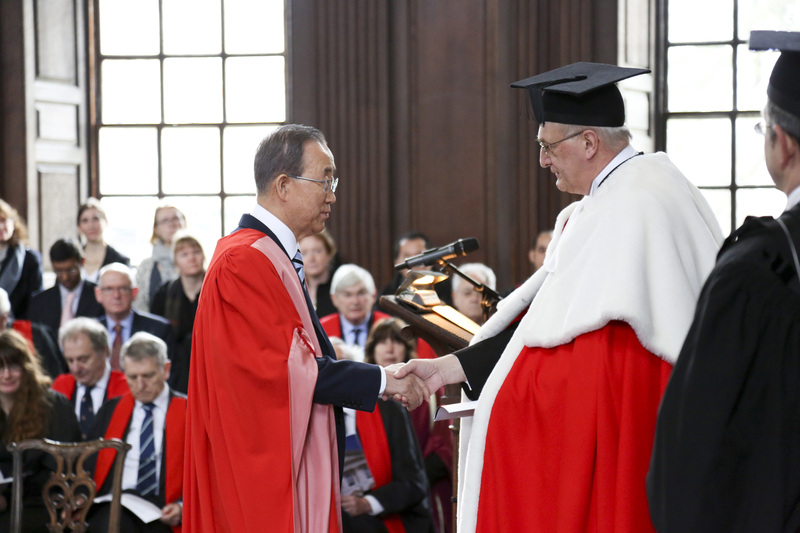 The honorary degree of Doctor of Law was conferred on the Secretary-General in recognition of his humanitarian work, support for women’s rights and achievements in pursuit of global peace and security. His 37 years of service with that Ministry included postings in New Delhi, Washington DC and Vienna, and a variety of portfolios, including foreign policy and national security. Mr Ban’s ties to the UN date back to 1975, when he worked for the Ministry's UN Division. Throughout his time at the UN, he has driven forward improvements to the UN peacekeeping operations. Accountability for violations of human rights has received high-level attention through inquiries related to Gaza, Guinea, Pakistan and Sri Lanka, legal processes in Lebanon and Cambodia, and advocacy for the "responsibility to protect," the new UN norm aimed at preventing or halting genocide and other grave crimes. He has also worked to strengthen humanitarian response in the aftermath of disasters in Myanmar (2008), Haiti (2010) and Pakistan (2010), and mobilised UN support for the democratic transitions in North Africa and the Middle East. Mr Ban has also increased efforts to rejuvenate the disarmament agenda. 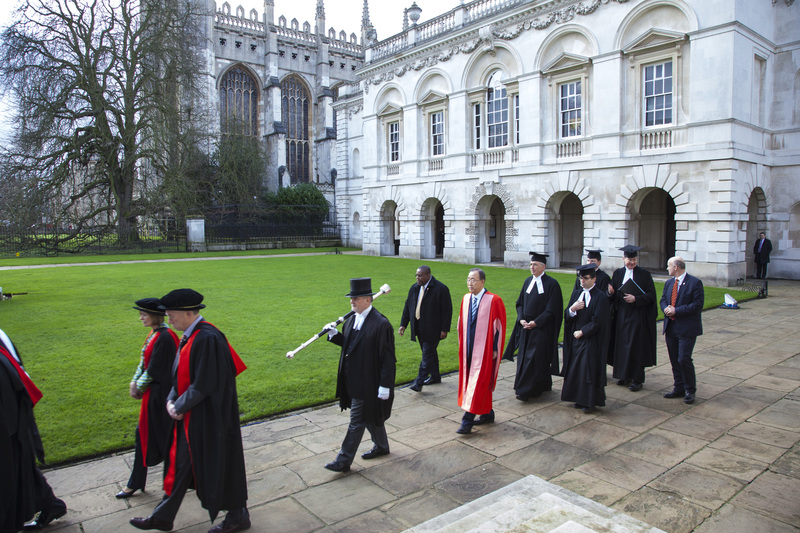 The University has been conferring honorary degrees for some 500 years. One of the earliest recorded ceremonies was in 1493, when the University honoured the poet John Skelton. An honorary degree is the highest accolade the University can bestow.